Femoral component. The end of the thigh bone cut very precisely, to allow the femoral surface of the knee to be replaced by a smooth metal implant. The size of the implant varies between individuals, and the ‘best fit’ for any patient is used. Tibial component. The top of the shin bone is removed to produce a flat surface. A metal ‘tray’ is inserted to replace the top of the shin, and a high density plastic ‘liner’ is inserted into the tray. It is the plastic liner that articulates with the metal femur component. Patella component. The kneecap maybe resurfaced at the same time. This is a plastic button, replacing worn bare bone of the patella, but leaves approx. 2/3rds of the patella remaining. In the majority of TKR’s, the patella does not need replacing. The diagnosis of OA is achieved with a history, examination and plain XRays. 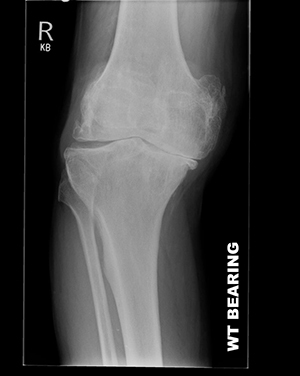 Any XR’s for suspected knee arthritis should be taken with weight bearing on the leg to highlight damage to the knee, rather than lying down. On occasions, an MRI maybe requested to assess whether the knee would be suitable for a partial replacement. Management of osteoarthritis in the knee where the whole joint is affected, follows general management principles for OA – namely non-operative options of weight loss where possible, analgesia and anti-inflammatory medications, exercise and possibly intra-articular injections. Walking sticks are a useful adjunct to reduce pain, and should be used in the opposite hand to the side of knee with arthritis. If the decision is made with you to perform a TKR, then it is important to get the knee as strong as possible prior to surgery, and ensure that general medical health is optimised. 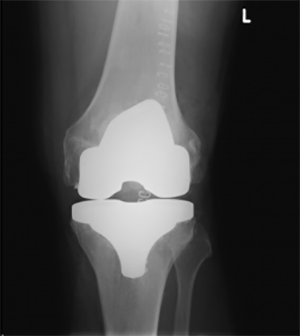 At surgery, all weight bearing surfaces of the knee are replaced, to abolish or reduce pain. 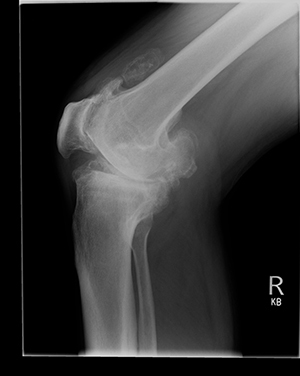 Whether the surface of the patella is replaced is a controversial topic. Mr Flynn will replace the patella portion of the knee if it is significantly worn and/or a patient complains of pain at the front of the knee prior to knee replacement. If the patella is in good condition, and there is no complaint of pain at the front of the knee, the patella will be retained, to reduce the risks associated with replacing the patella. Infection – 0.5 – 1.% . Infection risk is increased in individuals on immunosuppressive therapy, and in patients with obesity, or smoking or diabetes. Stiffness and swelling. Stiffness will occur after TKR – exercises are vital to overcome this, and to regain as good range of motion as possible. Loosening (Aseptic – ie. 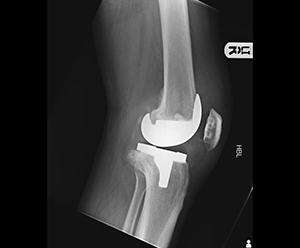 No infection) In the long term, this can lead to the implant working loose and further pain or instability, and may require a Revision TKR. Metal Allergies. A small number of patients have sensitivities to metals, in particular nickel or cobalt. If you have a metal allergy, you should make this known to your surgeon, and specialised implants can be used that have a protective coating to reduce the risk of a reaction. Mortality. The mortality rate after Total Knee replacement is related to age at time of surgery. In the NJR 2015 the overall risk is in the order of 0.5%. 90–day mortality risk under age 55y.o. is 0.07%, whilst risk for 85 + y.o. is 1.3% in females and 2.3% in males. Numbness. A small area of skin on the outside of the knee is often numb, due to division of one of the small cutaneous nerves crossing the incision. This is not a functional problem and reduces with time, but does not usually fully recover. 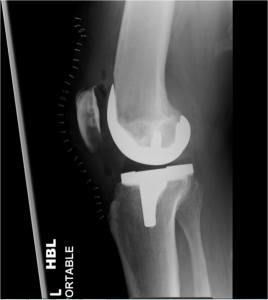 Once the decision to proceed with a TKR is made, a pre-operative assessment is conducted to review medications, general health conditions, and measure weight and blood pressure. Length of surgery? The procedure takes 60 -90 minutes, and the anaesthetic time is usually around 2 hours. Length of stay? Patients are admitted on the day of surgery. In-patient stay is usually 2- 3 nights. What type of anaesthetic? A TKR is performed under GA, or with a Spinal anaesthetic and sedation. The best option for any individual is discussed with the anaesthetist prior to surgery. What happens after surgery? Following surgery, the operated leg is placed on a Continuous motion device (CPM), to encourage the knee to move and give patients confidence that they can move the knee. A cryocuff compression device helps to reduce swelling. Physiotherapy usually commences on the day of surgery, and by the time of discharge, patients should be walking with crutches, able to climb stairs, get in and out of a car and manage bathing. Rehabilitation is again very important after TKR, to restore muscle strength, ensure full extension is maintained, and regain as much flexion as possible. The biggest predictor of final flexion after a TKR, is the amount of flexion before the operation. Using the cryocuff regularly helps reduce swelling and pain, which are the biggest obstacles to regaining good flexion. The scar is over the front of the knee – approx. 7-8 inches long (18-20 cm). The scar will fade with time, and it is very useful to massage the scar with creams or oils once it is healed. Will I be followed up? Follow up appointments are normally at around 6 weeks, 6 months, and sometimes 12 months post-operatively.